On December 12, 2014, four of us from Elder Law of Michigan in Lansing cheerfully volunteered our time to the Senior Wrapping Project at the Meridian Township building in Okemos. Approximately 50+ people were at the Township building wrapping 400 gifts that were chosen by seniors in the surrounding community. Ironing boards, irons, towels, coats, electrical devices, sweaters, robes, house slippers, pots and pans, and other awesome personal items were packed and wrapped with love. Pretty paper, bags, and bows were either donated or supplied by the City, and Christmas music played as we all wrapped our hearts out. 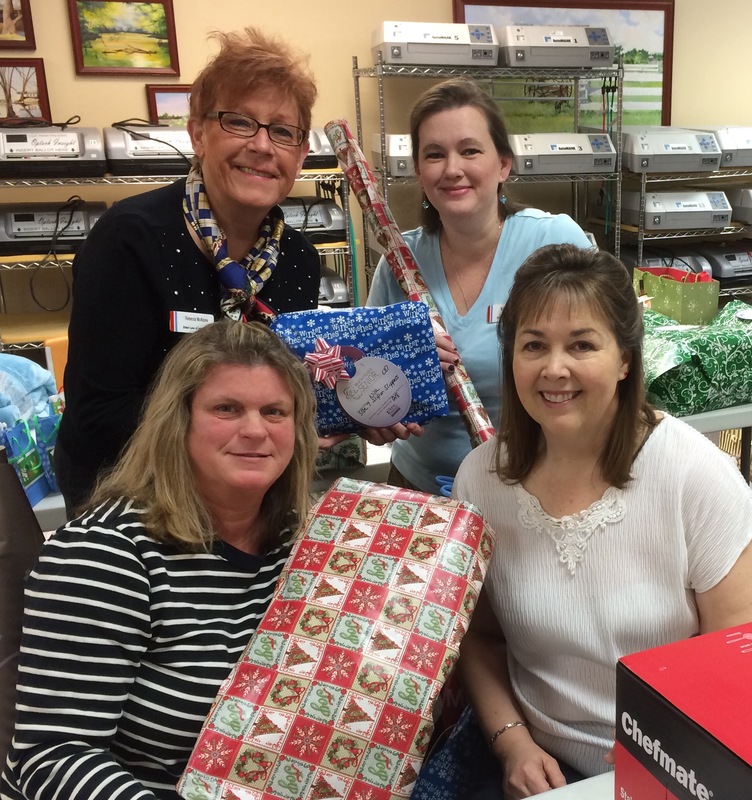 We felt like Santa’s elves: Michelle Jackson, Sheila Robison, Rebecca McAlpine and Kim Hill. We just knew our names were written on the “good list” in Santa’s big book! Pictured (from top left to bottom right): Rebecca McAlpine, Kim Hill, Michelle Jackson, and Sheila Robison. We had a good feeling just looking around to see the many people that were involved in this project. The community adopted seniors and bought them a gift of their choice. A receipt and name was attached to each gift and we knew many seniors would be so happy to get their prize gift. The generosity was outstanding and we look forward to helping with this project next year.